Unseen by all, chemicals leached into water, escaped into the air. People ingested them into their happy bodies as they celebrated their prosperity. Everything seemed fixable, including health, as long as one had money. Oh no don't just blame the government;everyone was in it. Your brother sold the fertilisers, and your uncle, the pesticide, his son in the government pushed the seeds, her daughter got a job as cancer nurse and my cousin has a busy medical shop. And doesn't our rich relative in the big city have a agro-chemicals factory to which flows huge government subsidies? Children sang out praising dams and factories as temples of modern India and the minister gave awards for bumper harvests. Everyone was part of the problem. Though the connections were obvious, no one wanted to see them. Umendra Dutt recalled Anupam Mishra: Once you shed ideological fixations you will see the only thing worth caring for is the environment. He decided the solution cannot come from the government or agitations against it, but from the people themselves. People must experience convincing results, and then they will vote without loyalty to any party but only for what they know is good. His mission would be to promote micro-successes. He quit Delhi and moved to Jaitu, near Bhatinda, a town of noisy streets lined with pesticide and fertiliser shops, open drains and vehicles racing about everywhere. He also quit the RSS; from now on he would belong to no party but befriend all parties in furtherance of his cause. He formed the Kheti Virasat Mission [KVM] -Mission for Traditional Agriculture- in 2005. The idea was to contact farmers, in ones and twos, persuade them to experiment with natural, traditional practices, to value quality and health above money, to become successes that others would emulate. He knew it was an unequal fight against the chemical monster that stalked Punjab but there was no other way to begin. He brought natural farming evangelists from elsewhere in India and had them conduct workshops for farmers. Manohar Parchure, Priti Joshi, Subhash Palekar, Subhash Sharma, Suresh Desai, Kavita Kuruganti, Sudhirendar Sharma, Dr G V Ramanjaneyalu, Davinder Sharma, Deepak Suchde and many others presented gentler ways with growing food. A whole generation and more in Punjab had become unaware that food can be grown with cattle manure and crop rotation instead of fertilisers, heirloom seeds instead of hybrids, mixed cropping instead of pesticides, mulching with residual biomass, patterning action based on seasons instead of endless water. Now they were being nudged to experiment. The younger ones were incredulous but curious, and the older ones quietly reconnected with the times of their childhoods. Umendra's great assets are his skills as a communicator, a persuasive way with people, a passion for his cause and his transparently simple, open way of life. He is single. KVM's office, guest room, and his home are all in a 300 sq.ft walk-up from a dusty Jaitu street. The main windowless room has a cot, a computer, a couple of chairs and heaped bundles of publications. From here he publishes his magazine 'Balihari Khudrat', here he meets his steady stream of visitors and here he retires for the night often giving up his cot to a visitor. The kitchen can fit just one person at a time and the washroom is even smaller. The second room -better than his, with a window- is a dorm for volunteers. He or KVM own no transport. His operations are driven by donations, publication sales and a confidence that money will somehow arrive. Ajay Tripathi, 51 is a family man with responsibilities. "And therefore his sacrifices are greater than any of ours," says Umendra. 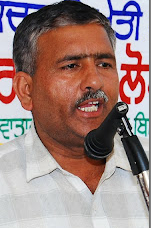 Tripathi's association with Umendra began in 2004. He is a researcher, ideologue, back-room man and a strong believer in KVM's work. He commands respect not just because of his knowledge, skills, abilities to communicate or hard work. Umendra says Tripathi has embraced poverty as a positive way of life. He is a role model of dedication to the KVM team. Gurpreet Singh,30 works as an organizer of KVM programmes. 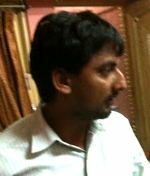 He met Umendra in 2005 while working for Pratham, which is an education outreach. "He promised me a good salary. It was an easy promise for men like him to make because they have no money but all the confidence! I would be paid as and when KVM got some money but I went for months without salary, pretending at home to be on a good wicket," he says with a big smile. He left for a steady job because he was getting married but Umendra blithely kept asking him to come back because there was much to be done and "money is no problem". Finally he couldn't resist coming back: "Now the pay is a bit steadier but it doesn't matter any more; the work does," he says, as Umendra sits nearby nodding and beaming. Amanjot Kaur is a bubbly Sikh girl in her early twenties. 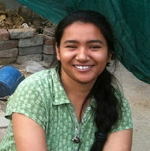 She applied to KVM for an internship in 2010, soon after graduating from Punjabi University, Patiala. And has stayed on. She comes from a traditional family, -her father is an auto mechanic- where it is unusual to send young women to live alone and work. On her visits home she is itching to get back to Jaitu. Her job is to get village women to start kitchen gardens, revive grandma's recipes, include millets in diet, to organise seed exchanges and discussion groups. "Oh, I expect and accept my parents will find me a groom one day soon," she says. "But the marriage is on only if he accepts my work with KVM will continue," she says with a toothy grin. Working with little assured money [-except for some steady funding from the Centre for Sustainable Agriculture, Hyderabad] the small KVM team since 2005, has established active contact with about 3,000 farmers who have attended workshops or subscribed to the KVM magazine. All of them now grow organic vegetables at least for their own consumption. All have stopped carpet spraying pesticides, though a vastly minimised, selective use may still be on. Fertiliser use is falling [-so much so, that traders filed a futile petition in the court to restrain KVM!]. About 300 farmers have converted part of their holdings to organic farming. 500 more are planning to convert. About 100 farmers have gone wholly organic. Exhibitions, seminars and workshops continue. There is a rising demand for their publications which carry instructional articles. Umendra Dutt is full of optimism: "But do go and find out for yourself," he says.